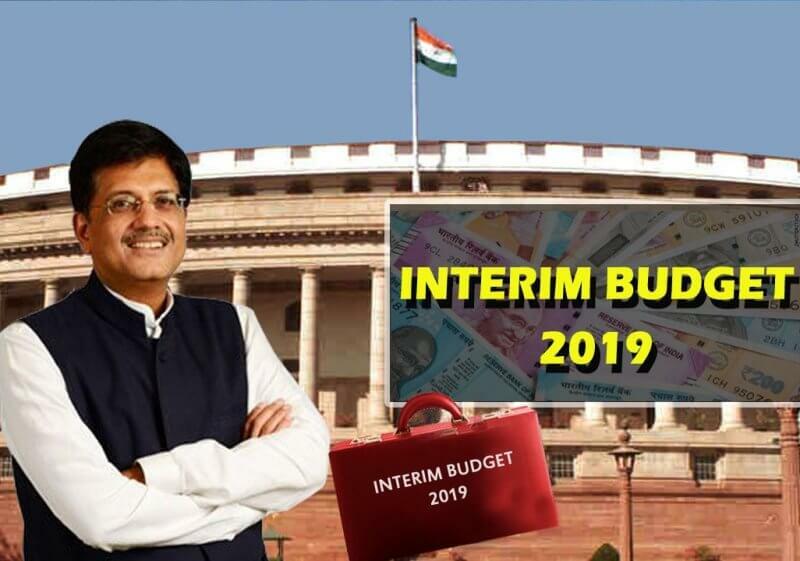 Piyush Goyal, Minister of Finance, presented the Indian Budget 2019 (Interim Budget 2019-20) on February 1, 2019. 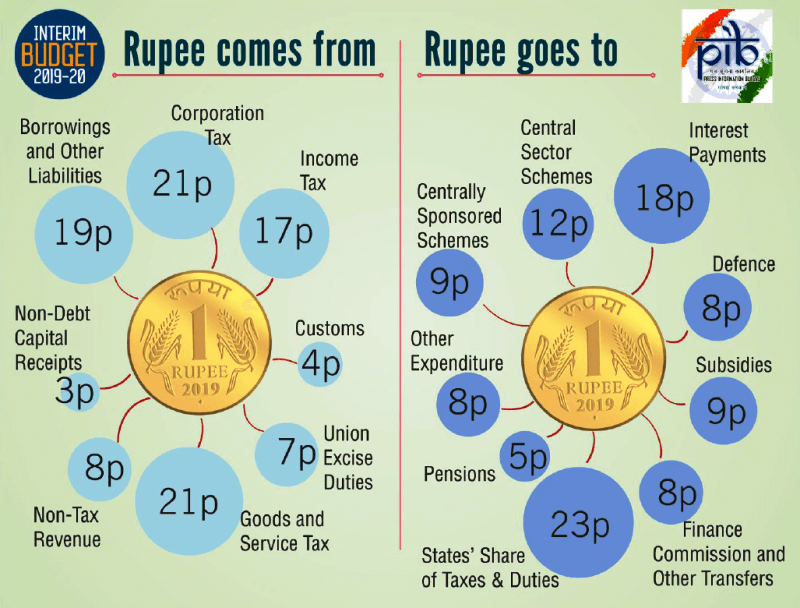 In this article, we shall help you not only understand the key points of the Union Budget 2019 but also understand the key concepts like Fiscal Deficit, Primary Deficit etc. By analysing the budget estimates, we help you find the key areas where you should look in the budget. 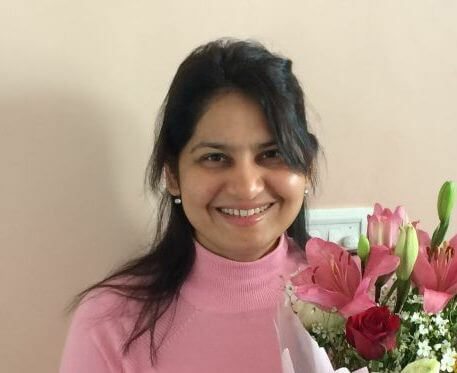 The Indian Budget 2019 is of 27.84 lakh crore rupees. The expenditure has increased significantly when compared with the Union Budget 2018, where the expenditure figure was 24.42 lakh crore rupees. The total revenue expected in the financial year 2019-20 (without considering borrowing) is only Rs. 20.80 lakh crores. As you can see the expenditure (Rs.27.84 lakh crores) is way higher than the receipts (Rs.20.80 lakh crores). To balance the expenditure and receipts side of the budget, the government needs to borrow money. The Indian government needs to borrow Rs. 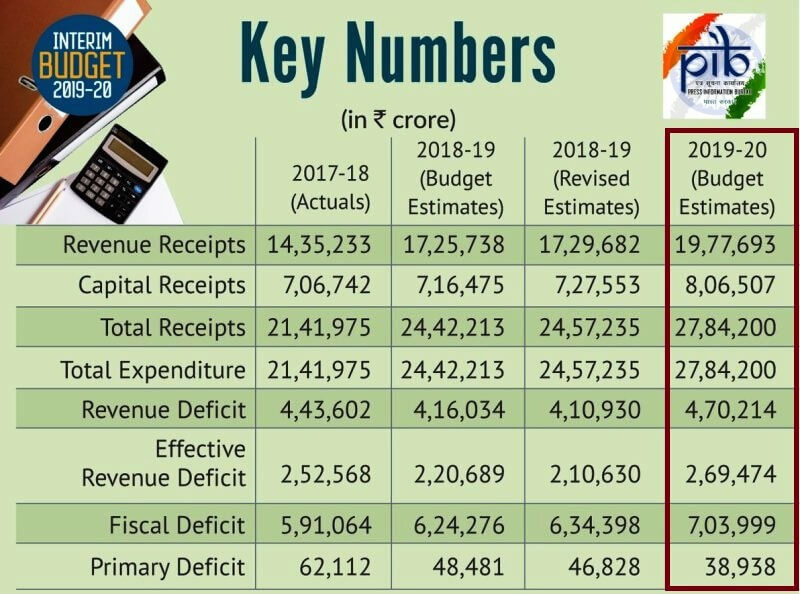 7 lakh crore in the financial year 2019-20 to meet its expenditure. Borrowings and other liabilities is known as Fiscal Deficit. Fiscal Deficit = Total Expenditure – Total Receipts excluding borrowings. 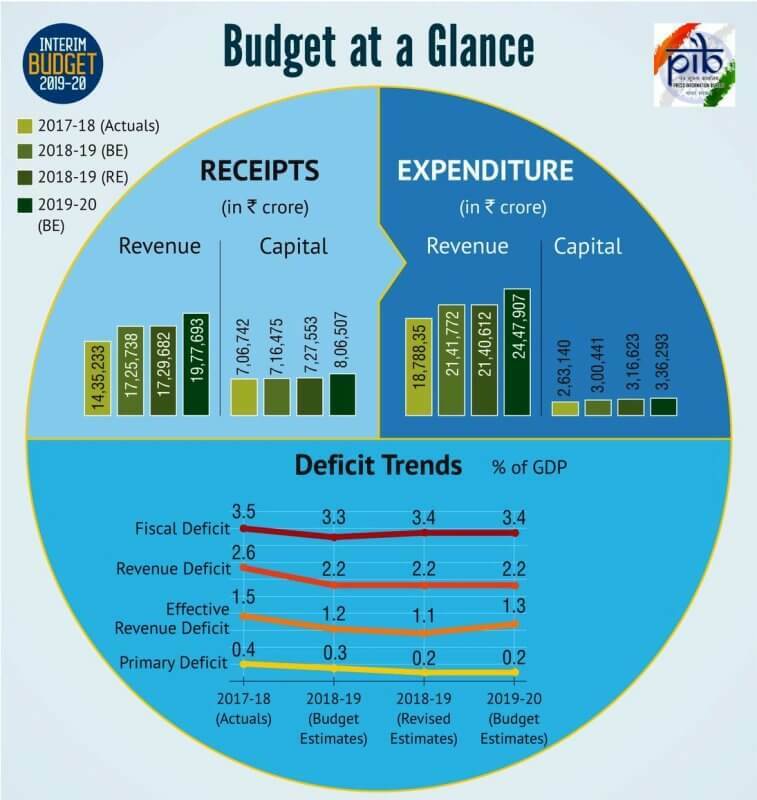 As per budget 2019, Fiscal Deficit is 3.4% of Indian GDP. Ideally, Fiscal Deficit should be kept below 3% of GDP. The current rate is above the Financial Responsibility and Budget Management Act (FRBM) guidelines. I shall discuss in detail about FRBM in another post. However, you should note that borrowing is not always a bad idea – if the borrowed money is used for productive purposes. For examples, if borrowed money is used to build capital assets like factories, roads, railways etc – that is productive. This would result in better employment opportunities as well. However, how does the Indian Finance Minister plan to utilise the borrowings as per Indian Budget 2019? Interest Payments are Rs. 6,65,061 crore! The Indian government had already taken many loans – mainly from the public. The interest payments for the same is above Rs.6.6 lakh crore. You may note that this is just for interest payments and not for principal repayments. So how much amount is left for productive investments? To find this, you need to deduct Interest Payments from Borrowings. It can also be expressed as Fiscal Deficit – Interest Payments. How much will it be? Rs. 703999 crores – Rs. 665061 crore = Rs. 38938 crores. This figure is known as Primary Deficit. The Primary Deficit of India, as per the latest budget is Rs. 38938 crores. This comes only as 0.2 of GDP. What should you understand from this figure? The value of primary deficit denotes the borrowing which is not used for interest payments. Out of the borrowed money, only 0.2% of GDP is, in reality, available for productive purposes. The government also try to meet its expenditure by selling the shares of public limited companies. For 2019, the government hopes to get at least Rs.80,000 crore, though the target mentioned in the budget document is Rs.90,000. In 2017, the government had obtained about Rs.1,00,000 crore via disinvestment route. As we mentioned before, for a country to grow, it should invest in productive assets (capital assets). With that perspective in mind, the main figure to look at is capital expenditure. Only this figure would be used to build infrastructure – road, railways etc – which would help in future growth. Out of the total expenditure of Rs.27.84 lakh crore rupees, only Rs.3.36 lakh crore is allocated for capital expenditure (12%). If the grants in aid given to states for capital asset creation (Rs 2 lakh crore) are also included, the total expenditure on the capital asset creation side comes only to 20% of the entire union budget. The Finance minister estimates a tax revenue of Rs.17 lakh crore for the financial year 2019-20. This is much higher expectations than the current year revised estimates of Rs.14.84 lakh crores. Apart from tax revenue of Rs.17 lakh crore, the government also expect to get Rs.2.7 lakh crore as non-tax revenue. Spending on the revenue side would not build any new assets. Revenue expenditure is used for day-to-day expenses of running the government machinery like salary, pension, interest payments etc. Ideally, a government system should be efficient enough to generate surplus income from the resources on which it gives a salary, pension etc so that the additional revenue can be used for capital expenditure. However, in the case of India, the government machinery is not generating enough income to even to meet their salary or pension. To understand the case better, consider a government project to collect a particular tax. If the salaries, pension, and administrative expenses of the project is Rs.10 crore, and if the project is able to collect only Rs.6 crore as tax, running this project results in a loss of Rs.4 crore rupees. In this case, it’s even better not to collect tax! That is the reason why, the FRBM act, even in 2003, mandated to eliminate the revenue deficit completely. However, the fundamental problem of revenue deficit still exists in the Indian Budget. The total revenue receipts estimated are Rs. 19.77 lakh crore while total revenue expenditure is Rs.24.47 lakh crore. “This isn’t interim budget, this is the roadmap for development”, says Finance Minister. 10 point vision for 2030 to realize India’s social economic potential; 10 trillion dollars economy in 13 years. Present Income Tax rates to continue; Full tax rebate up to an income of 5 lakh rupees for individual taxpayers; Standard deduction raised to 50,000, a hike of 10,000 for salaried class. Direct tax system simplified; Returns to be processed in 24 hours with immediate refunds. 90 per cent GST payers can file quarterly returns; Small and Medium Enterprises to get two per cent interest rebate on an incremental loan of one crore rupees; A Group of Ministers to examine GST burden on home buyers. Customs to go for digitalization of export and import transactions. Allocations to Defence budget crosses three lakh crore rupees for the first time. Allocations to Health care, MGNREGA, SC/ST welfare programmes, Pradhan Mantri Gram Sadak Yojana, Development of infrastructure in North-East hiked substantially. Electricity connection to all willing families by next month. One lakh more villages to get digital connectivity. A National Centre on Artificial Intelligence Centre. Rs.6,000 yearly direct support to farmers through PM-KISAN Programme. Rs. 3,000 pension for unorganised sector workers earning up to 15,000 rupees through a mega Pension Scheme – Pradhan Mantri Shram- Yogi Maandhan. Government e-Marketplace – GeM to be extended to all Central Public Sector Enterprises. Over three lakh 38 thousand shell companies deregistered after demonetization. A container cargo movement to the North-East through Brahmaputra river; Allocation for infrastructure development in the region hiked by 21 per cent. Indigenous development of semi-high speed Vande Bharat Express train. A separate Department of Fisheries. An All India Institute of Medical Sciences – AIIMS for Haryana. Single window clearance for shooting films to be made available to Indian filmmakers. Cinematograph Act to be tightened to check piracy. A programme for genetic upgradation of cow – Rashtriya Kamdhenu Aayog. Great to know that the explanations helped. All the best for your exams! 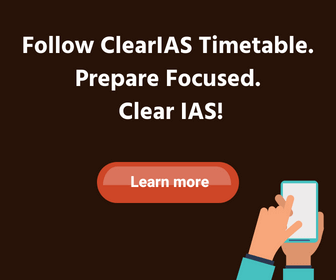 Although our notes are focussed for UPSC CSE, many of our topic-notes will be useful for RAS as well. We will be publishing more articles in the coming days. Good information in simple format. Got clarity . Thank you ClearIAS. Superb! Happy to know that you got clarity regarding the budget. All the best! Thank you for your valuable feedback. All the best! You are welcome. Thank you for your feedback. All the best! It’s our pleasure. As per the sources Economic Survey 2018-19 will be delayed. It may be presented only along General Budget 2019, after the elections. Thank you for the feedback. All the best! Happy to know that the article helped you. All the best! This Rs.3000/- pension to workers of unorganized sector is per month or per annum? Monthly pension once one will cross the age of 60. Great to know that. Thank you for the comment. All the best! On behalf of all the students, I thank the team of CLEARIAS. THANKYOU MENTORS! You’re awesome! Thanks a million! Thank you…… so much for your great effort sir……. now there is no union excise duty,now gst has been implemented.In revenue part of Rs1 -you mentioned 7% goes to Union Excise duty.It is contradicting with GST. Thanks for your value added materials on multiole subjects and free services sir.